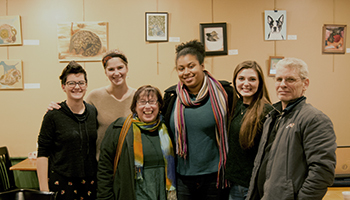 On Friday, December 2, the Cazenovia College FA 405 - Arts in the Community class, taught by Professor of Art Anita Welych, held an arts and craft show to benefit a local animal shelter, Wanderers' Rest. With generous support from Cazenovia College and the Village of Cazenovia, the class raised over $200. As part of the course, Welych offered students the opportunity to carry out a group project that extends to the community. Students brainstormed possible ideas for events and were extremely enthusiastic about holding an art sale as a benefit event. "Students have been responsible for virtually every aspect of this project - designing the event, gathering artwork and preparing it for display, installation, soliciting donations, and organizing every part of it. I'm really proud of their commitment and positive energy!" commented Welych. The big question, who would be the beneficiary? Students were very passionate about a lot of different groups, but it wasn't until one student, Tatiana Fowler, shouted out "animals" that the class decided on a local shelter. Since the Photography Club has a great community connection with Wanderers' Rest, students in the class were eager to continue to help this organization. "Our event was a huge group effort and it ended up a success!" said Tiffany Hill, visual communications student. "We had some people donate money without even buying anything. It just goes to show that our community is really great and generous!" Cazenovia College Dining Services, President Ron Chesbrough, Sylvia Needel, Kelli Johnson of Common Grounds, Visual Communications student Kayla Volkomer, Martin Welych-Flanagan, Sarah Cross, Jo Buffalo, Lee Beals, Anita Welych, as well as other faculty and students who donated artwork and baked good. "I could not be more proud of my class. Every single one of them followed through and met or exceeded their obligations," added Welych. "Thank you Katie Balura, Trent Cappelletti, Jasmine Cirbus, Morgan Curtis, Emily Esty, Tatiana Fowler, Rose Hickman, Tiffany Hill, Rebekah LaRue, Simone Maderal, Ashley Morey, Richele Musall, Rachel Phillips, Abby Radcliffe, Clarke SmithMarie Veschusio, Lindsey Welkley, and Stephanie Williams."